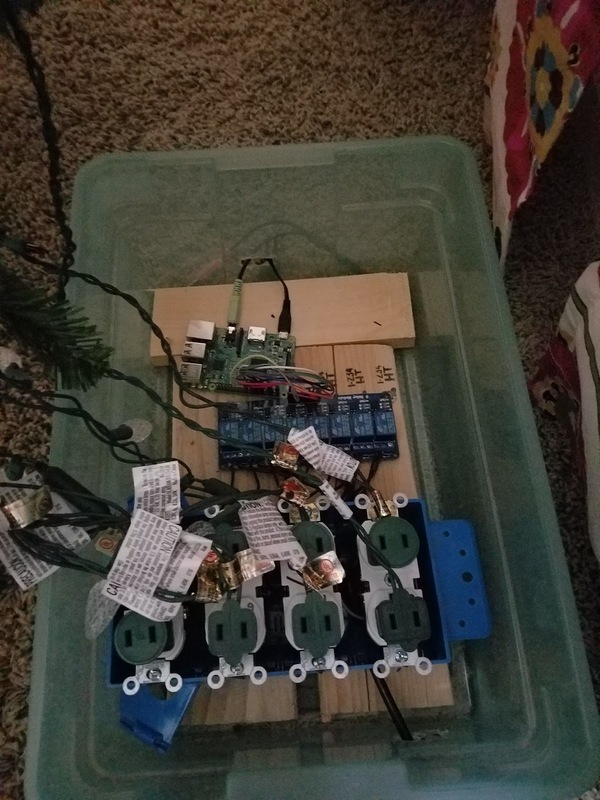 I had needed an excuse for a while to by the Raspberry Pi, and I had wanted to do the Christmas light thing for a while so I finally pulled the trigger this year. I purchased a Raspberry Pi 3 and 8 channel solid state relay and some outlets. The software is open source and is awesome: LightShowPi. The software is so easy to use, right out of the box. Once you get the Pi up and going its cake. 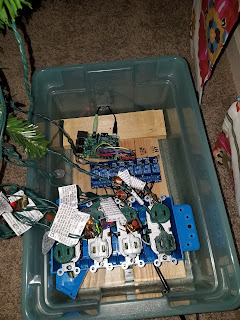 The toughest part of the whole project was wiring up the 8 outlets but even that was pretty simple. 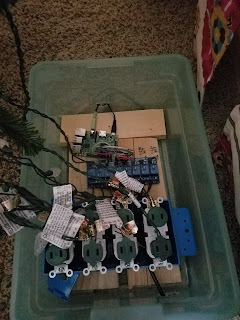 Once you get them wired up its just a matter of getting everything hooked up to the Raspberry Pi correctly. I know I am abstracting a lot of steps here and not really showing a thorough guide here, I will try to post a step by step in the future. Here are some pictures and videos of the finished project. 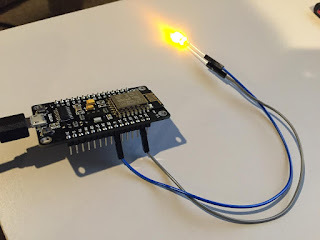 Found this sweet Instructable http://www.instructables.com/id/ESP8266-GMail-Sender/ detailing how to cook up a Gmail Sender using the ESP8266. 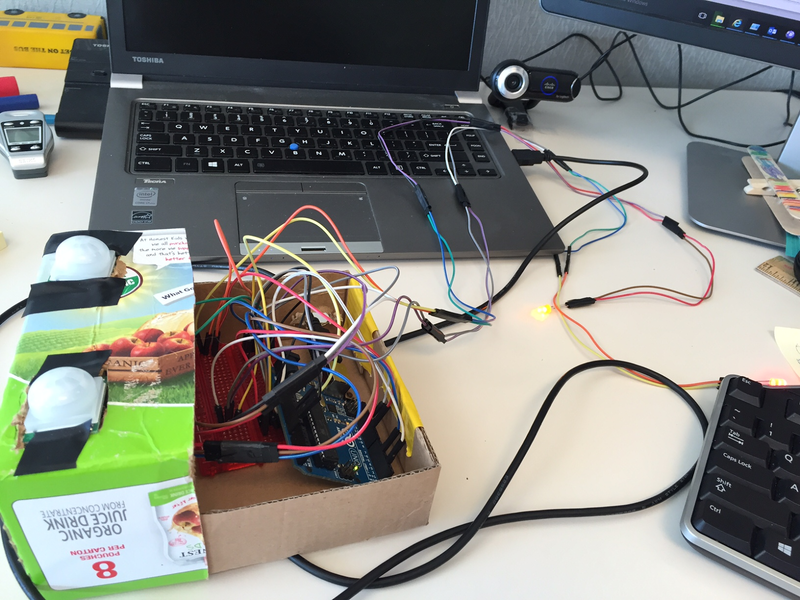 So I hooked it up with a temperature sensor and started testing sending notifications based on various temperatures. 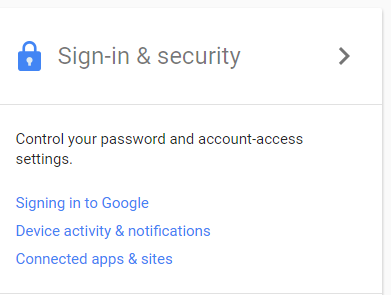 I created a new account because you have to enable less secure apps access on Gmail. Create your account and then go to Gmail. You should land on the settings for your new google account. Enable the Allow Less Secure Apps option at the bottom of the page. 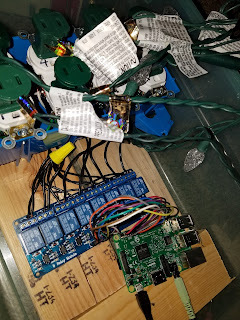 I had some trouble connecting the ESP to the Arduinio IDE at first. I followed several different tutorials online. There are some good detailed tutorials about how to add the board to the IDE and such. 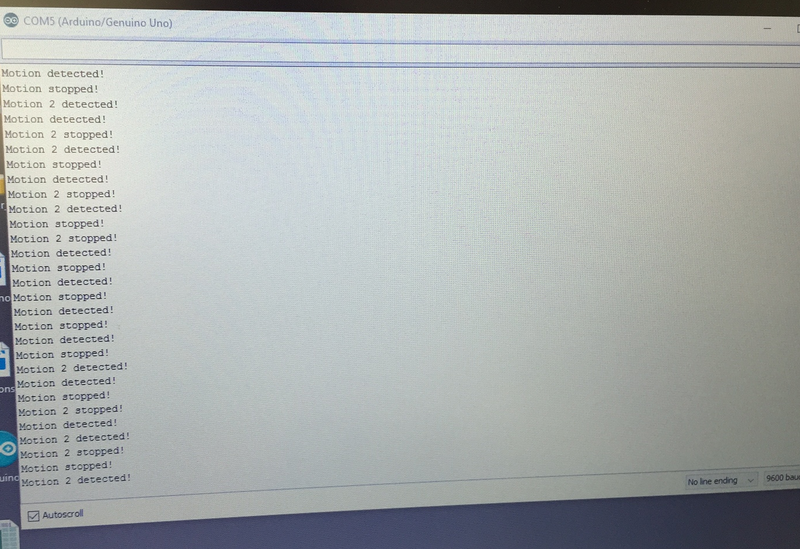 I think the final fix was a full reboot of my Desktop. It just magically started working. Perhaps I can cover that in a future blog post, but for now I am just going to assume you have your ESP working with the Arduino IDE. Go snag the original ZIP file from the Instructable link above or go here to snag a copy of the zip file. 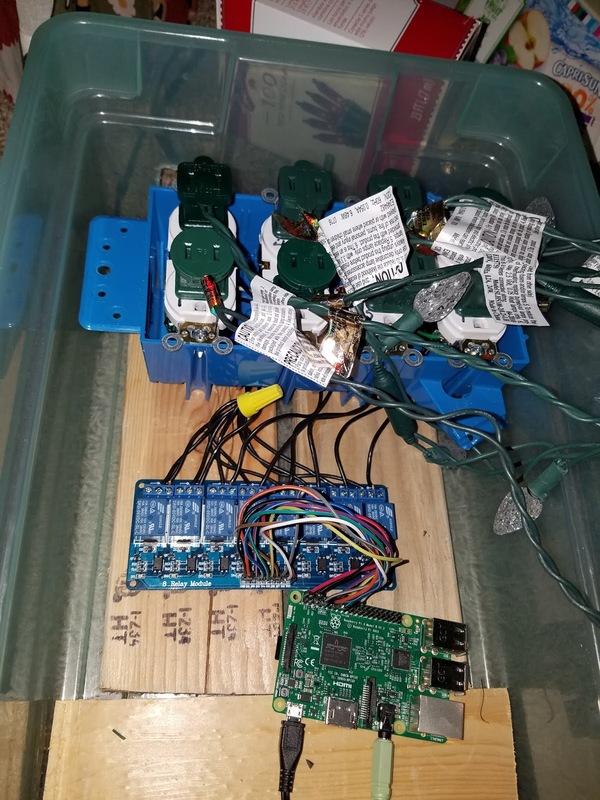 So this project will read the temperature from a temperature sensor and then will send an email if the temperature is within a specific threshold. 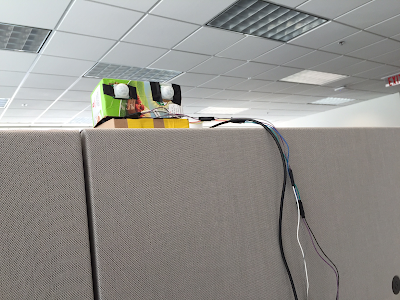 I modified the code on the original Instructable page to enable it to read the sensor and send the email. You may want to work with the original code from the Instructable before moving on. This will ensure the core functionality (wifi connecting and email sending) is working before moving on to sensor reading. I have pasted my Sender file below. This file will connect to your WiFi and then will read a temperature sensor every 30 seconds. If the temperature falls within a defined threshold it will send an email. If all goes well the sketch will upload and compile. You will start seeing temperature readings in the Serial Monitor output. You will also see a connection to Gmail if the temperature falls within your defined range. I have been running a lot this year. I am currently training for the Kansas City Full Marathon. 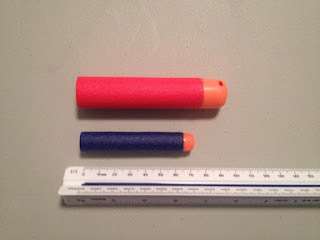 I was looking for a way to Heat Map my runs and I stumbled on the solution today. 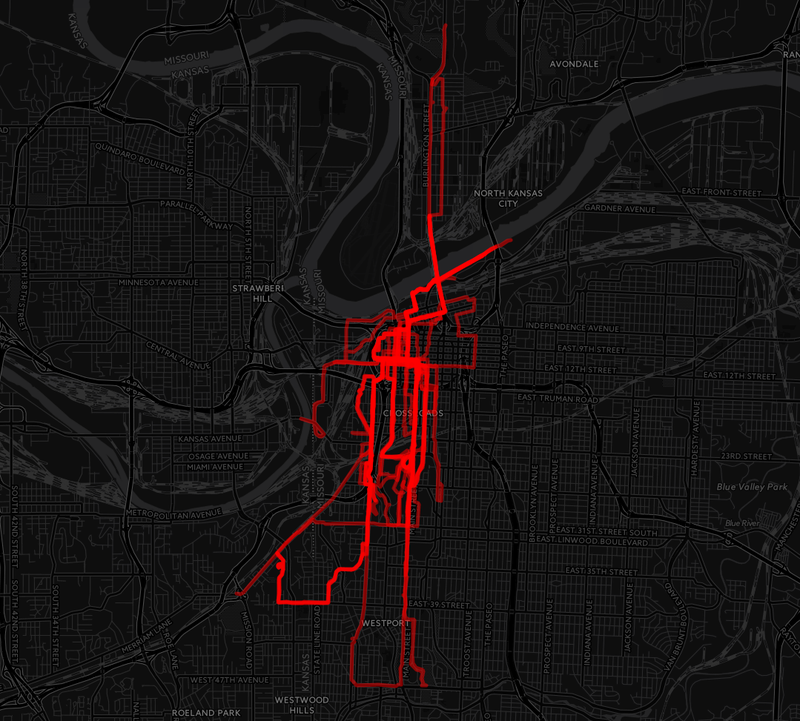 Here is a sample Heat Map of my Downtown runs. First you will need to get your files. I use the RunKeeper app to track my runs. RunKeeper allows you to download your run files in GPX format. 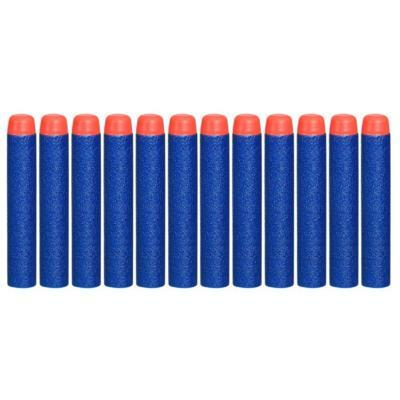 The website I used to build the Heat Map allows you to use GPX and other files. Download your RunKeeper GPX files, or grab your files you want to import. Browse to your GPX files, or whatever format you used. Choose the background you want to use. A while back I ordered two LoLin ESP8266 modules from eBay for super cheap. Off and on I was messing around with them trying to get them to work...with not much luck. I wasted a lot of time trying to get the ESP8266s to work with the Arduino IDE for some reason. 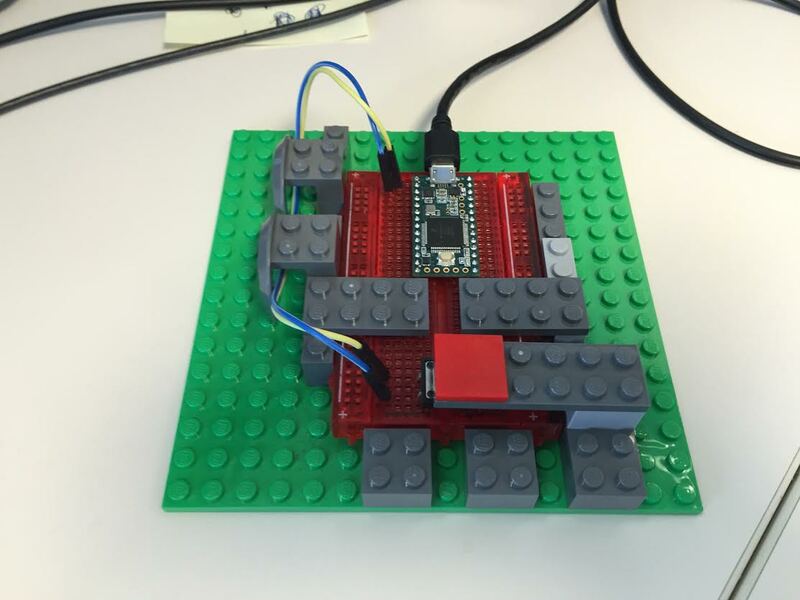 I finally wised up and pitched the Arduino IDE idea and started using the LuaLoader. The interface is a little cludgy and old looking but man this thing app works great. Download and install the LuaLoader. Click the settings menu in LuaLoader. You should see Open COMX on the setup menu. The LuaLoader automatically knows which COM port you are using. You should see a Connected Response and the COM section on the Top right should be green. BOOM, you have an IP. You are now ready to start your quest to learn the .lua language. Below is a sample script. 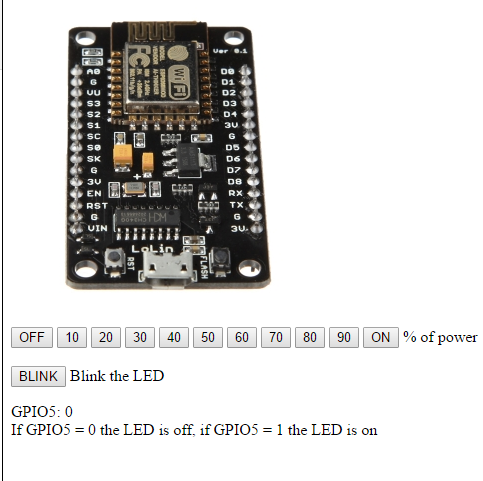 This script will start up a web server on the ESP8266 and will present some HTML. The web page will allow you to interact with an LED. Each 10s button will increase the intensity of the LED. If you click OFF it will turn the LED OFF, if you click ON it will turn the LED on 100%. If you click BLINK it will blink the LED on and off. 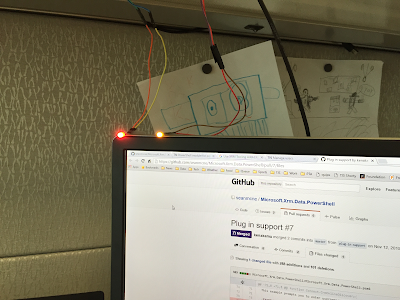 You will also notice that we read the GPIO Pin to determine if the LED is on or off. This will come in handy as we start to incorporate some other sensors. We can start adding Relays, Temperature sensors, Motion detectors, etc. Modify the code as needed. You will notice I am using port 85, you can use whatever port you want. 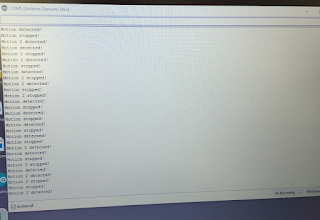 Also I am loading an image from my web server. You can change that to whatever you want as well. Save your script with the name init.lua. LuaLoader will upload your file. Once the upload is complete click Dofile. 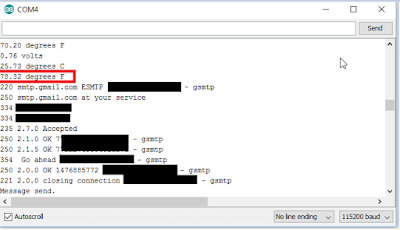 Hit the IP address with the Port you specified in a web browser. You should be able to control your LED using the web page. So if you call the lua file init.lua, the ESP8266 will load this file on boot. This is cool because now you can find an external power source (I've been using a spare ChromeCast power brick, anything 3.3V to 5V should work) and the ESP8266 will load your program on boot. Meaning you can plug this thing in anywhere it can hit WiFi and you can start interacting with it via the web. It is safe to say I now realize how much work this is. 30 something regular season games...sheesh what was I thinking. Oh well. I have played I think up to game 6 here is the Game 3 review. Game 3 features a clash against the Moose. The Moose sent out their ace hurler Horstman. Horstman shutem down in the fist at what looked like a long day for the Sirloins batters. Things changed quickly in the second when this happened. Jake Pounders is the next batter...415 bomb to left center, no doubts. Things get uglier in the Bottom of the 4th for Horstman as a string of hits adds another 3 runs to the score. 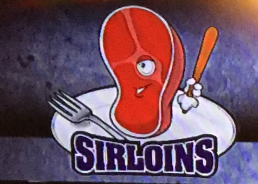 The Sirloins have a commanding 9-0 lead. The Sirloins tack on another in the bottom of 5th to go up 10-1. At this point Sirloins ace Blaze is crusing having only given up 1 run. The final nail in the coffin for Horstman's day was in the bottom of 7 after Blaze steps up. Blaze jacks a 375ft solo shot to left finally chasing Horstman from the game. Vaughn comes in to close it down. Final 13-3. So the Toast Notifications did not work as I wanted. The notification would appear then disappear real quick sometimes and I would not even see the notification. So I went back to make a large window show up every hour approach. I found a link on how to make custom forms in PowerShell and started tweaking it. My buddy Doug Challenged me to do some Overhead Bulgarian Squats so that is the exercise of the day. It is going to be a rough day. 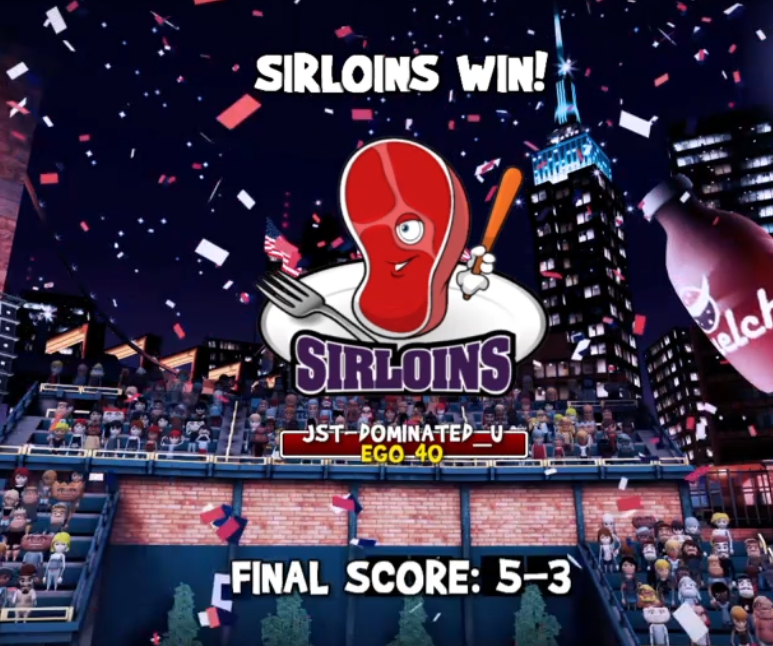 After a close game 1 victory the Sirloins kept their winning ways in a matchup against the Herbisaurs in Game 2 of the 2016 season. Casey Royal got the 2nd inning run explosion started with a leadoff double. Benny Rodriguez followed up with a single to right. In stepped Jake Pounders who pounded a 3-run 426 Foot blast to right field. Hole Camels bloops a single into right followed by a Willy Mays Hayes single. Green Gras hits a double to right to make the score 4-0. The Herbisaurs flashed some leather with a sweet 2 out snag at third by Henny Hampster. Not to be outdown Hole Camels started a sweet double play in the bottom half of the second. Camels showing his skill at the plate with a triple off the top of the wall in the 4th. Green Gras then hits a towering 2-Run 433 ft blast to center to make the score 6-0. Hammer adds a RBI single in the 9th to increase the lead 8-2. Wild Thing Vaughn is called in to close it down. 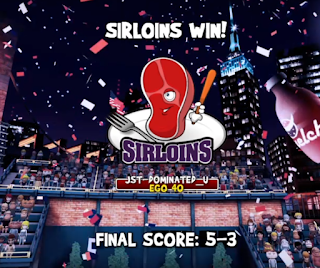 The Sirloins add another tick in the W column. 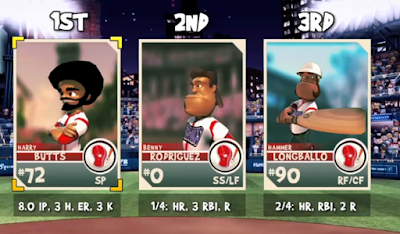 The Sizzling Sirloins are off to a hot start after their ace Harry Butts tosses an 8 inning 1 earned run gem to kick off the season with a 1 in the W column. The Sirloins got on the board first in the bottom of the 2nd inning when Casey Royal leads off with a double. Followed by a Jake Pounders double to Center Field scoring Casey. Opposing pitcher Jovita Pulo helped out his cause in the third scoring on a Casey Royal throwing error to tie the game. Harry Butts gets some help from his defense Green Gras knocks down a laser and makes the play. Hammer Longballo smokes a 436ft bomb to center to give the Sirloins the lead in the 6th frame. Bottom of the 8th saw some more action as Hammer starts off the inning with a single. Casey Royal lines one off of Pulo and the runners are safe at first and second. Pulo may have been razzled a bit after taking the line drive from Royal because he throws a mistake to Benny Rodriguez and Benny makes him pay with a three run jack to center. 432ft titanic blast. Wild Thing Vaughn comes in and gives up a few garbage runs but starts a double play to finish up the game. I enlisted the help of some friends to name the team. 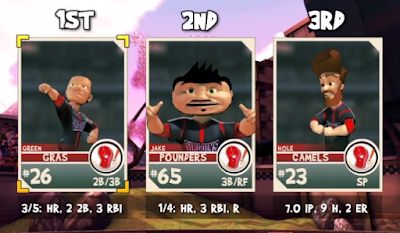 I received several naming ideas and whittled them down to 18 players to fill the roster. It is my pleasure to prsent the 2016 Sizzlin Sirloins. 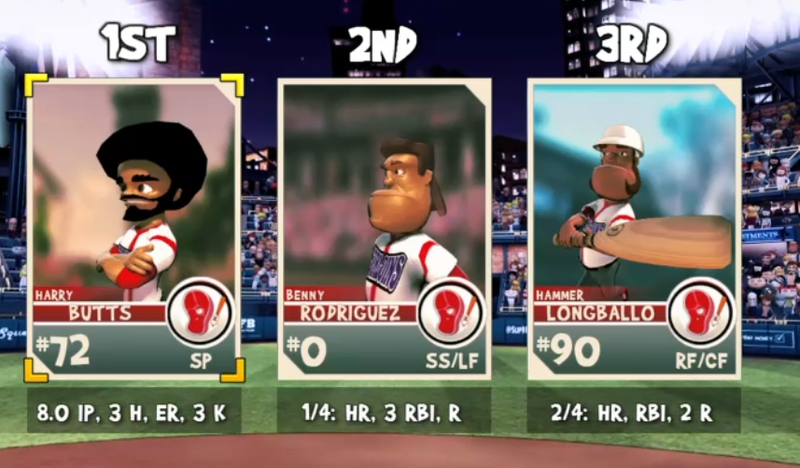 Benny Rodriguez SS Meteoric rise from the Sandlot to the Sizzling Sirloins Starting Short Stop. Willy Mays Hayes CF "Don't your guys go anywhere, I plan to put on a hitting display". Hammer Longballo RF Part 2 of the Longballo Bros. Hammer is a 5 Tool player and with the Mojo to back it up. Glovey McGloveface C Baseball is Glovey's second career. He runs a high power hedge fund in NYC. Sometimes he wears one of this Bluetooth ear pieces closing deals during the game. Joltn Joe Garageiola Bench OK Power, great contact. Ol Joltn Joe can give you a hit when you need it. Has some peculiar pregrame rituals. Skweez Bundt Bench Short Pop Fly power, can barely make contact but can field decently with a decent arm. No surprises what Skweez is up to when he is called in to hit. Jacque Strap Bench With a name like his you at least need confidence. 99 Mojo, dude is energetic to say the least. Locker next to Hammer, which Hammer complains about often. Sabre Metrics Bench Speed and Contact to deliver timely hits when needed. Calculates his BABIP in real time after each AB. Harry Butts SP The Ace. I guess its sorta my fault when I said Middle School Humor was acceptable, but hey should be a fun season talking about Harry Butts Pitching Dominance. Hole Camels SP Distance cousin is a starter for the Phillies. 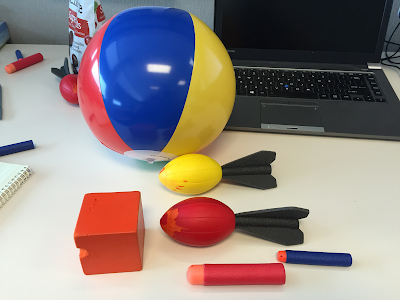 Junk ball pitcher with great accuracy. Ground ball machine. Blaze N. Kays SP Convinced he can throw it past anyone. Off-speed stuff is sub par so he relys too much on the heat. Ed Harris RP Old Ed Harris limps out of the bullpen when skip needs him. Ricky Vaughn CP Wild thing Vaughn, straight from his playing days in the California Penal League. How did you get there, "Stole a car"
Below is a list of all the players attribute values. So there we have the opening day line ups. I will start the season with the EGO set at 40. The EGO is a measure of how difficult the game is. I played a pre-season game with an EGO set to 50 and was beat 9-4. 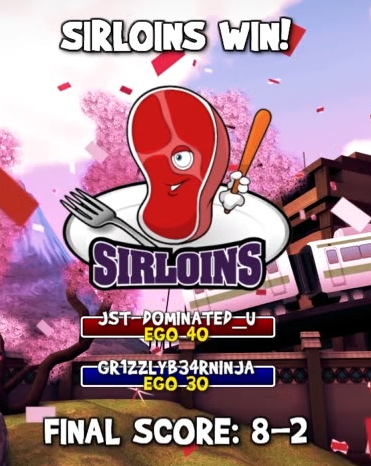 Hopefully the 40 EGO will make the games nail-bitingly close. I will adjust the EGO as needed. I work in IT, which means I have the opportunity to sit for about 7-8 hours a day. I hate this. Therefore I try to run over my lunch break, I purchased a desk cycle to pedal while I am sitting, and recently I added another tool to my Battle the Sedentary work lifestyle toolbox: Weights. Me and a buddy started doing some weight trainnig at the desk. We brought in a pair of 25 pound dumbbells and a pair of 10 pound dumbbells. Now we are doing some weight training at our desk by executing burnout sets (as many as you can lift) with various exercises. A frequency of every hour was decided on meaning at the top of every hour we would complete a burnout set of an exercise in a round robin format. Of course some days you get head down in some work and sometimes may forget to execute your burnout set. Therefore we had a need to build some kind of notification system to remind us its time to workout. Thus the DeskWorkout2.ps1 script was built. The first version would pop up an HTML file based on what exercise was up in the list. This worked ok for a while, but I was looking for an excuse to use Windows 10 Toast Notifications. So I started searching around for a solution. 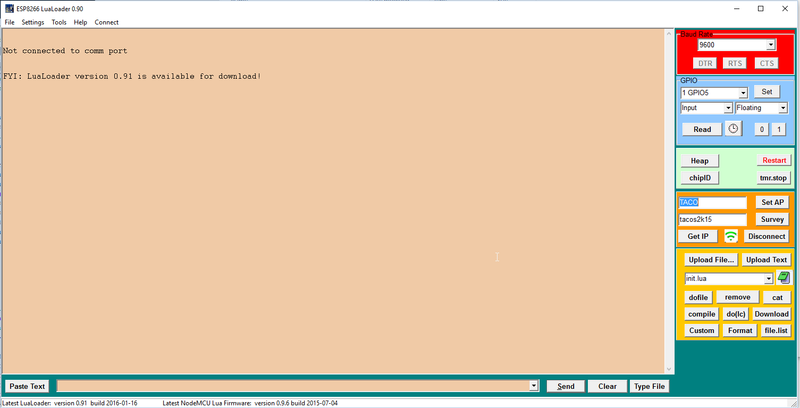 I quickly found a python solution that would create a Windows tosat notification. It is really straight forward and simple. The original Desk Workout script was written in PowerShell so I searched for a PowerShell solution as well. The PowerShell solution was created using the BurntToast Module available on Github. Since the original script was already created in PowerShell I went ahead with the PowerShell version. The Powershell Version allowed me to put a picture in there too, so that was cool. I wrapped the Script with an hour of sleep. So now all I have to is remember to turn it on in the morning. I stored the various excercises in a local database and wrote a stored procedure to advance through the various workouts. Should be pretty self explanatory here. I have two sons at home and needless to say they have a hard time remembering to flush. Why not build a tech solution for it. The Flush Reminder 7000 has a PIR motion sensor and a buzzer. It will sense motion and then will mark when the motion ends. If the measured time between start and ending motion is > 10 seconds the buzzer will play the Eye of Tiger tone to help them remember to flush the toilet. I am still tweaking the sensor position and some of the code, but it is working pretty good for a 30 minute Friday Night Arduino project. Video of the Flush Reminder 7000 in action. I have been kicking around various bot ideas since reading this article: http://www.theverge.com/2016/1/6/10718282/internet-bots-messaging-slack-facebook-m. I was also looking for an excuse to purchase a Teensy. These 2 forces combined to create the AnswerBot 3000. This is nothing spectacular, could just as easy be a web service too. In fact with a web service I would have more options and features. However there is something about a physical push button that makes this satisfying. Essentially you push a button and AnswerBot will randomly choose one of over 100 things to say. Sometimes AnswerBot's response are timed perfectly, sometimes they are a little weird. That is an actual quote from answer bot. The inconsistency of his responses makes it funny. Especially in your IM conversations with friends and colleagues throughout the day. So basically you just set NUMBER_OF_WORDS to the number of phrases you put in the char array. Upload it and you are done. I surrounded AnswerBot 3000 with legos to make him look cooler. I'd like to purchase a smaller bread board so i can reduce the footprint. No soldering done here because this is a temporary project and I do not the trouble of desoldering. So there you have it. AnswerBot 3000 version 1. Any parting words Answerbot? I was tired of using this bloated Java software to do my time captures. 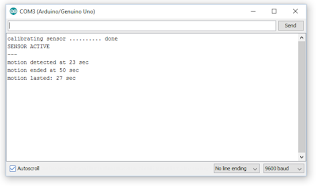 So I did a couple searches and found out Python can do it in just a few lines of code. From there I found a quick sample script to capture image. I had multiple cameras on my laptop so I just disabled the one I didn't want. I assume you can pick a camera using pygame but "ain't nobody got time for that". So this will loop through 1000 times snapping a picture every 5 minutes. I turned it loose and will see what happens over the weekend. Because why not really. I wanted to query TFS with PowerShell anyway so I might as well integrate it with my Blink(1) USB LED. First you need to download and install Team Foundation Server Power Tools. Here is the link for the 2015 version: https://visualstudiogallery.msdn.microsoft.com/898a828a-af00-42c6-bbb2-530dc7b8f2e1. Make sure you do a custom install because for some reason the PowerShell cmdlets are not selected in the default install. I created this script to connect to our TFS server and connect to the project I wanted to monitor. I wanted to see all defects that were not closed, back log, or resolved state. This will take the current count from TFS, and compare it with the previous count stored in a text file. I know this is low tech but I wanted a quick solution. You can do whatever you want with the basic count code. If the current defect account is lower than the previous you can send an email, update a database, update a webpage, whatever. I enabled the API on the Blink(1) and decided that I would play a color pattern if the defect count was lower, and a different color pattern if the defect count was higher. 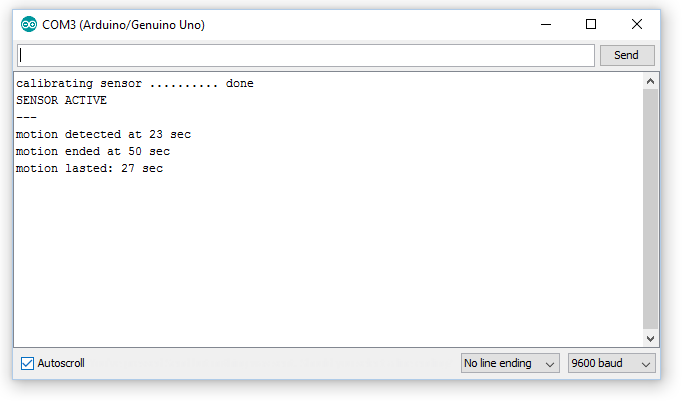 So then I set the PowerShell Script to run every 5 minutes using task scheduler. If the defect count goes up I display the Fire Engine Pattern, if the defect count goes down I display the dancefloor pattern. Below is a video showing how it works.